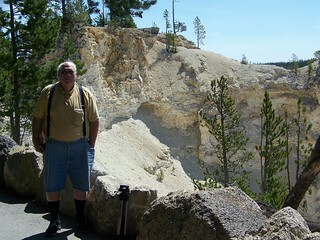 On the way to NARAM, the national model rocket contest, my brother Dan and I took a short side trip to Yellowstone Park. More pictures beyond the cut. 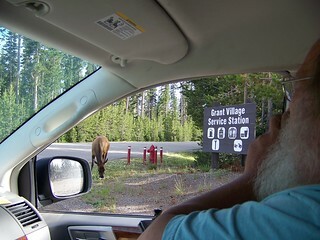 There are elk at Yellowstone. 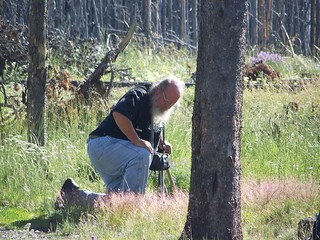 Lots of flowers to take pictures of. A beautiful lake at our campground. Yellowstone Falls is not really that big. That looks like a lovely side trip. I am a bit jealous; I would like to get out and canoe on a lake like that. I know they allow boating (and fishing) on that lake. The altitude is on the order of 7,000 feet, so be prepared to take it easy if you actually do go there. Nice pics, & sounds like a nice visit. Good deal! Did the yellow stone fall? Indeed, some of it did! 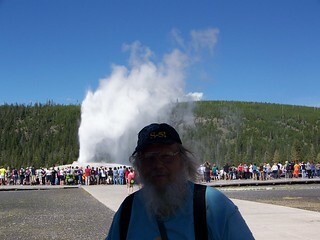 I have fond memories of visiting Yellowstone in 2011 with baby Greg, who puked just as Old Faithful erupted. Very apropos, son. Excellent! (about the postcard that is.) Have a swell time in Europe! All I can think of is how, during our 1966 trip, we made fun of Dad for being such an old coot talking about going there "twenty years ago..." Of cours that was, er, damn near 50 years ago. eep! Yay! Hope you have a great trip !